The National Geographic Society and the National Science Foundation are hosting a 2 week virtual teacher workshop that uses National Geographic's ground breaking research tool, Crittercam, to explore the mysteries of ocean life. Deployed on the backs of whales, sharks, seals, sea turtles and more, Crittercam provides an unprecedented look at the marine world through the animals' perspective. The workshop is open to all teachers looking for a way to bring the wonder of the world's oceans to their students. Teacher resources will include access to research findings, lesson plans, links to news stories, magazine articles, video clips, and Internet links. In addition, the first 3,500 participants will receive a Crittercam: Oceans for Life CD ROM which includes a half-hour "interactive" film highlighting Crittercam research. The CD ROM showcases breakthrough technology that allows users to click on what they see in order to access additional content, pictures and video. Following an introduction by John Cleese, two scientists who use Crittercam in their research will "present" keynote lectures and be available for open dialogue with participants. As a fishery biologist for National Oceanic and Atmospheric Administration, Frank Parrish, Ph.D., specializes in habitat ecology and has published papers on lobsters, bottom fish, reef fish, deepwater corals and most recently the Hawaiian monk seal. In these studies he employs a range of tools including mixed gas diving, submarines and, since 1995, Crittercam. Frank will discuss his research and his role in the race to identify the critical foraging habitat of the endangered Hawaiian monk seal. As the Betz Chair Professor of Environmental Science at Drexel University, Dr. Jim Spotila has over 100 scientific publications on the physical ecology of vertebrate animals. 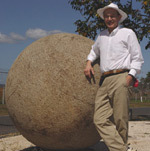 He has conducted research in Costa Rica since 1978 on sea turtles. Since 1990 he has studied leatherbacks at Las Baulas National Park on the Pacific coast working with local communities and government authorities to conserve this species. Dr. Spotila will discuss his research and use of Crittercam in his studies. Invented by Greg Marshall, the Crittercam is a research tool designed to be worn by wild animals. This tool combines video and audio recording with collection of environmental data such as depth, temperature, and acceleration. These compact systems allow scientists to study animal behavior without interference by a human observer. Combining solid data with gripping imagery, Crittercam brings the animal's point of view to the scientific community and a conservation message to worldwide television audiences. For more than a decade Crittercam has given us insight into the lives of whales, sharks, seals and sea lions, sea turtles, penguins, manatees, and other marine animals. In 2002 the first prototype of a terrestrial Crittercam (designed for land animals) survived its maiden voyage on a wild African lion, opening the door to a whole new world of animal-borne imaging research. Greg is a two-time Emmy Award winner for Cinematography and Sound (National Geographic Specials "Great White Sharks" , and "Sea Monsters: Search for the Giant Squid" ). 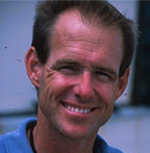 He was producer and a principal cinematographer for a one-hour EXPLORER film, "Tiger Shark". Recently Greg created and produced "CRITTERCAM," a new 13-part series that has been aired on the National Geographic Channel during 2004. The new National Geographic Education Network (www.ngsednet.org) is a free online network just for teachers and other educators. Here you can apply for exclusive professional-development opportunities such as this one, and others ranging from marine-sanctuary studies to Geography Action! and JASON program training. Plus, get lesson plans and other resources, discuss issues with peers through forums and e-mail, and much more. inspire the spirit of exploration and the wonders of science for your students.